WOLVERHAMPTON made it a Magnificent Seven at Monmore Green with a 62-28 demolition job of Somerset. 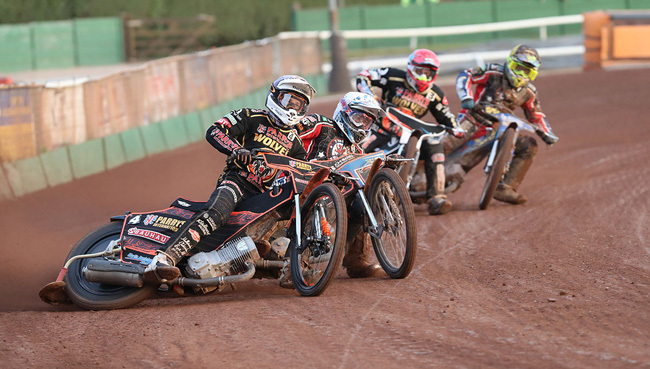 The Parry’s International Wolves made it seven wins from as many home outings in all competitions this season while equalling the 34-point winning margin achieved against Ipswich back in April 2007. Freddie Lindgren and Jacob Thorssell weighed in with full maximums as Peter Adams’s men seized control from heat one. Wolves generally found themselves in front before hitting the back straight even when they had not gated and the Rebels had no response, failing to gain a heat advantage all night. The key partnerships of Lindgren and Kyle Howarth and Thorssell and Rory Schlein each teamed up for a pair of 5-1s from the three heats they contested together in a totally one-sided contest. “We had too much strength for them in every department,” said Adams. “I expected us to win comfortably tonight and so it proved. But while the unstoppable show made Adams buoyant, he refused to get carried away with talk of back-to-back league championships. “We will concentrate on getting into the play-offs first,” he said. “We do look well capable of that and if we do so, it all depends on what kind of form you hit at the time and who you’re up against. WOLVERHAMPTON 62: Jacob Thorssell 15, Freddie Lindgren 12, Sam Masters 11+2, Rory Schlein 8+2, Kyle Howarth 7+2, Nathan Greaves 5+1, Mark Riss 4+3. SOMERSET 28: Paul Starke 7, Patrick Hougaard 7, Jake Allen 6, Rohan Tungate 5, Josh Grajczonek 3, Jan Graversen 0, Charles Wright R/R.